The public is invited to a reception and awards ceremony for the unveiling of the 2014 art installation at the South Carolina State Library's Talking Book Services Art Gallery. Due to the temporary shutdown of the federal government, beginning Tuesday, October 1, all Library of Congress and National Library Service (NLS) for the blind and physically handicapped will be unavailable. The public is invited to a reception and awards ceremony for the unveiling of the 2013 art installation at the South Carolina State Library's Talking Book Services Art Gallery. This week Talking Books Services patrons have been experiencing delays in their book deliveries. We are aware of the issue and apologize for any problems these delays have caused. We are currently working with the postal service to remedy the situation. 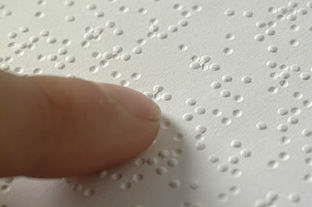 Braille is used throughout the world by people who read a variety of languages. Louis Braille designed the coding system, based on patterns of raised dots, by which the blind can read through touch. 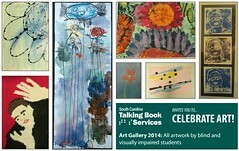 Talking Book Services invites all visually impaired and blind students in South Carolina to create a work of art to be entered into the Celebrate Art! Exhibition. Judges will choose a winner in each division. Winners will receive a prize. The Talking Book Services Readers Advisors have moved into 1500 Senate Street, however the collection is still at 1430 Senate Street. For now, we ask anyone who would like in-person service to wait. Please continue to call, email or fax us with your orders and they can go out by mail as usual. Patrons of the Talking Books Services are eligible to download Reader's Digest and Newsweek in Digital Talking Book (DTB) format. The American Printing House for the Blind is proud to offer free downloadable editions of Reader's Digest® and Newsweek® to eligible readers who are blind and visually impaired and who are registered members of the Talking Books program. Contract issues have delayed the publication of the May--June large-print issues of Talking Book Topics and Braille Book Review and the April--June large-print issue of Musical Mainstream. Delivery of these magazines should be complete by the week of July 6, 2012.